This post is filed under Events, Fundraisers, Promotion. 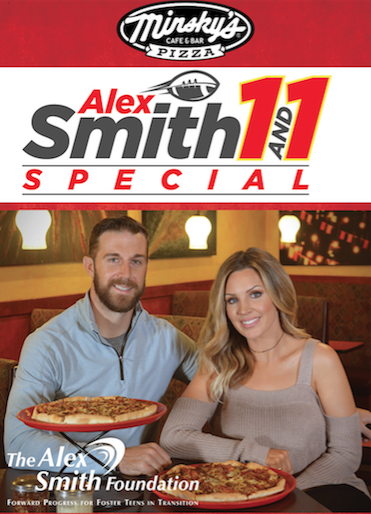 The Alex Smith Foundation is teaming up with Minsky’s Pizza again to continue their mission of helping foster children in the Kansas City area. This holiday season, when you buy ONE pizza at Minsky’s, add another ONE of equal size and save 11% off the second pizza – plus, Minsky’s gives 11% to the Alex Smith Foundation. You can help The Alex Smith Foundation with this great cause and save on Minsky’s Pizza all through the holiday season! If you’re a Minsky’s VIP, you’ll receive a coupon by email. Not a VIP yet? Click here to sign up! Minsky’s will send you your coupon right away – and other great deals in the future! If you prefer to order online using your smartphone, desktop, or tablet, no need for a coupon! Just head to Minskys.com and enter code Alex11 at checkout! You choose the size – Large, Medium, Small or Mini – and get a second one for 11% off – order as often as you like, December 1st 2016 through January 1st, 2017!